﻿ Riad Sidi Ayoub Marrakech. JIMAT di Agoda.com! Ada soalan mengenai Riad Sidi Ayoub? Bagi para pelawat yang ingin menikmati sepenuhnya pengalaman di Marrakech, Riad Sidi Ayoub merupakan pilihan tepat. Hanya sejauh 6. Km, hotel 4-bintang ini boleh diakses dengan mudah dari lapangan terbang. Untuk pilihan bersiar-siar dan tempat daya tarikan tempatan, pelancong tidak perlu pergi jauh dari hotel kerana ianya berdekatan dengan Place de Foucauld, Herboristerie la Sagesse, Tanneries. Menawarkan tetamu hotel perkhidmatan yang unggul dan pelbagai kemudahan, Riad Sidi Ayoub komited untuk memastikan penginapan anda berada di tahap seberapa selesa yang mungkin. Untuk menamakan beberapa kemudahan di hotel ini, terdapat khidmat bilik 24 jam, Wi-Fi percuma semua bilik, pengawal keselamatan 24 jam, pengemasan harian, khidmat teksi. Tetamu boleh memilih dari 7 bilik, semuanya yang akan memberikan suasana ketenangan dan keharmonian. Senarai lengkap kemudahan rekreasi boleh didapati di hotel, termasuk tab panas, sauna, kolam renang tertutup, spa, rumah urut. Riad Sidi Ayoub merupakan tempat yang ideal bagi penginapan pelancong yang mencari keindahan, keselesaan dan kemudahan di Marrakech. Everything was great, we loved the place and the service. Thank you very much! Positive: beautiful Riad/hotel and nice roof top. Clean and neat rooms with beautiful decorations. Pretty quiet location a bit off from the noisy square and streets. Delicious dinner that you can book in advance. Friendly staff. Negative: Poor English language skills of the staff, better if you know French or Spanish. Poor sound insulation from outside as you can hear if other guests are talking outside your room. A bit difficult to find the first time as you have to go through some narrow alleyways to reach the hotel. No proper sound insulation between bathroom and hotel room inside the hotel room. Overall good experience! Basic but cute. 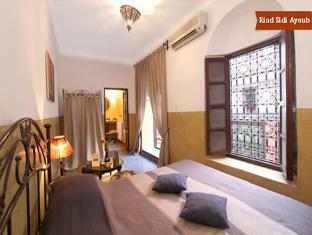 Traditional, well kept Riad. Beautiful facilities and quiet. Rooms are small and bathrooms have the typical plugged drain and smell. Staff at this hotel are so nice and kind to us. When I arrived in Marrakech, the owner came to the plaza nearby the hotel to pick us up because the hotel is located in a kind of difficult place to find. Also, when we got in trouble with the locals in front of the hotel, they helped us. The room which they upgraded to suit was clean and comfortable with a huge bed. This hotel also has the nice courtyard where you can enjoy mint tea which was served as a welcome drink! The location was also good, just 15 mins walk from main plaza. However, you should be careful especially when you're alone walking around the hotel (some locals try to take advantage of you). Overall, I really enjoyed staying at the hotel, and recommend you to stay there! The staff were incredibly friendly and helpful! 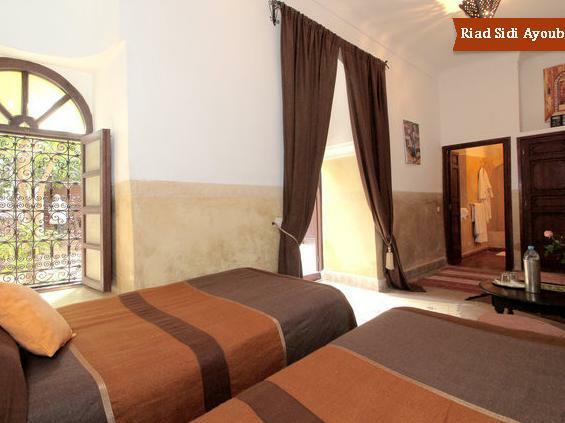 Though the riad is a but hard to find the first time, it is definitely worth it. Clean, peaceful, friendly staffs and feels at home! Though its quite an adventure going to the square but its part of the experience in Marrakech. 15-20mins walk to jemaa el fna. Had always a good sleep at night. Theres no hot shower but its ok with me. And thank you Youseff for arranging my tour to the desert! Friendly and welcoming road in excellent location if you wish to stay in the Médina. Facilities are basic but clean and pleasant with a shady courtyard and lovely roof terrace. Yousef and his team are helpful and warm. Only issue was the 4 am airport taxi which they booked for us did not turn up and despite assurances the night before there were no staff around at that time to help or make phone calls, necessitating a stressful scurry to the main square with suitcases and nearly missing our flight! Alhamdullilah a lovely place to be but the location a bit difficult to navigate. the staff come and pick u up. thank god for that. Loved it here, staff were super friendly and helpful. The shower needed an upgrade but it did the job. The host and staff is very friendly and helpful.they helped us recharge our SIM card and tell us how to go to the main square. The breakfast is fabulous,according to the host,it's a local cuisine which me and my friend enjoyed it. There is a small fountain, and it is very beautiful. The building/decoration. The helpfull staff, The relaxed atmosphere. riad sidi ayoub is located where one gets lost the first time. it's a little challenging to navigate to the riad, but as all places around the medina, everything seems to be in a maze-like. good thing, one of the staff/family members met us outside, and we were given a map of the place. mohamed was very helpful, and spoke good english, so there was no language barrier problems. breakfast was included. 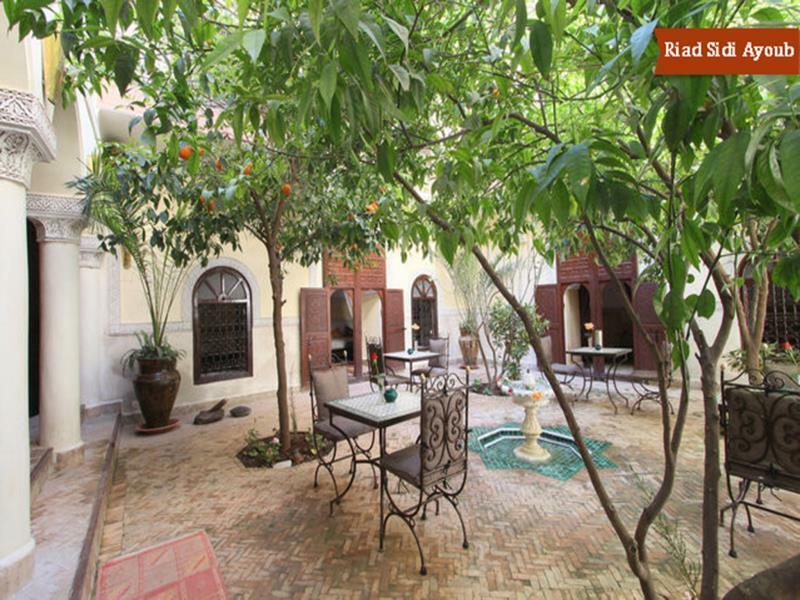 the big square in the medina is about 15 minutes away by foot from the riad. we were given a room with lovely moroccan design and architecture. overall, the place offered good value for money. there was a small pool across from the reception area but we didn't use it as it wasn't heated. we arrived by taxi from the airport, there was an extra fee for the guy who guided us to the hidden place in the medina. once we arrived a real oasis opened. very friendly service persons. unfortunately there was no wifi in the upper rooms. all together an experience of original ryad we appreciated very much. After a bad start when our room was not available when we arrived >(had to sleep first night in another Riad) we was very satisfied with our Suite when finally able to move in the next morning. 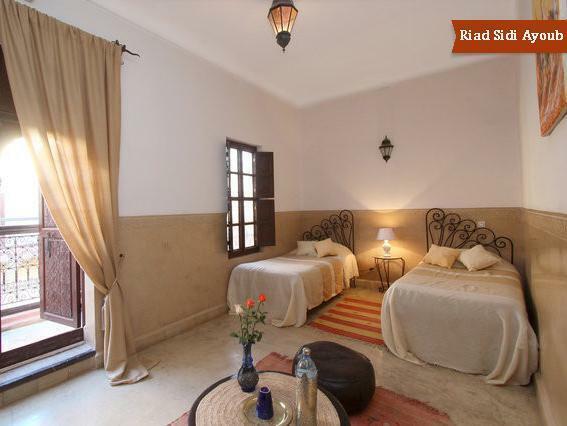 Small Riad (7 rooms9 , a short 10 min walk from the market and Jamna El Fna. Its easy to get lost in this part of Marrakech as we did the first day. Language are mainly French in addition to arabic and berber, english are not very common in the old part of Marrakesh. Service minded staff at the Riad made our stay a good one, they prepared good food for us, helped us with tours and travel arrangements. 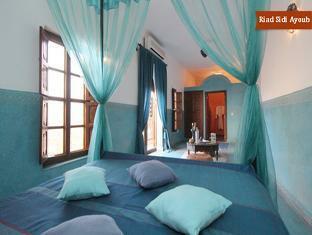 This Riad has got new owners and some of the informations on their webpages are no longer valid. It was not possible to buy wine to go with our food in the Riad as advertised, but we found a Carrefour shop selling alchohol in a shoppingmall just outside the old city. Shopping in the Souks can be very tiring and a biig hassle. Most sellers are demanding 10x price from tourists, whatever you look at seems to be called antiques and are expensive. we ended paying about 10-20% of asked price for the items we bought, if you dont like to bargain then stay away from the souks. All in all we had a nice week in Marrakech. Lovely hotel, clean, initial service was very nice. Transfer was by the hotel. It is 200 dirhams vs 80-100 dirhams by the "small taxi". But the taxi will not know where to find the hotel, so it is worth it. Being a riad, ie a hotel with rooms giving onto a central court yard, it was on the noisy side as we could here the other guests and staff till late into the evening and starting at 7:00am in morning. Location: 15 minute walk if you know how to get there through some narrow muddy (if it rains) alleyways and streets to the main souk and square. Beware of all the people trying to propose to you directions and or guiding y as they either will send walking in circles and keep pointing in the wrong direction on purpose or charge more than 10 euros to get you there. The first days, the staff were very nice and friendly. On the day of check out, we were requested to free the rooms early (10am) as other guests were coming "soon". It was cold (14 deg C) and we left the hotel for the airport at 2:30pm, with no new comers in voew! My wife was frozen from waiting in the guest lounge which was comfortable but had no heating. At no stage were the staff sympathetic to her to ask her if she was comfortable or warm or if she wanted anything. We had a great stay in this Riad. It is everything we expected a Riad to be with lovely open courtyard, great rooms and very friendly staff who were very helpful. We arranged an airport pick-up which worked well. We had dinner in house one night which was probably the best meal we had in Morocco - big helpings and very well presented. 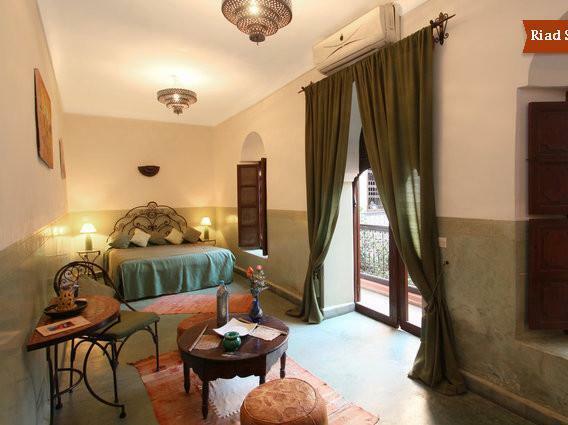 We would highly recommend this property for your stay in Marrakech. Das Personal versteht mehr französisch als englisch, bei uns gab es leider nur einen Mitarbeiter der englisch fliesend sprach. Trotzdem haben alle Abmachungen geklappt. Man Läuft ca. 10-15 Minuten zum zentralen Platz, man geht am Anfang aber durch ein nicht so touristisches Viertel, wo wir uns nicht so sicher gefühlt haben. Uns ist aber nichts passiert. Die zwei großen Mankos sind aber eher, dass a) man die Zimmer Türen nicht abschließen kann und b) es ziemlich schwer zu finden ist. Die Taxi Fahrer versuchen einen über das Ohr zu hauen und man muss noch extra dafür bezahlen, dass jemand einen dort hinführt.